• Clean your camera on a regular basis effectively remove dust and other dirt which increases camera’s useful life. • Make sure your camera’s battery is fully charged before your sensor cleaning process to avoid low power reflector turn back to cause damage. • One swipe in each direction. The swabs are not reusable. • Do not use sensor cleaner in extreme temperature. It works the best in room temperature. • Keep out of reach of children. Do not eat or play with it! 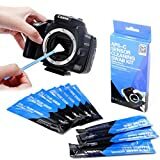 This entry was posted in Discount Photography and tagged 16mm, APSC, Camera, CCD/CMOS, Cleaning, Digital, DSLR, Sensor, Swab, Swabs by Ball Photo. Bookmark the permalink.